Way back in the day, before we were pregnant, I didn't really know what I thought about cloth diapering. I kind of thought it was odd, but I knew cloth diapering usually equaled a cost savings. When I became pregnant, I knew a bit more about cloth diapering, and we knew, right off the bat, we would cloth diaper. This post won't serve as an exhaustive resource of everything one needs to know about cloth diapering. If you're looking for a good resource for that, I recommend Googling "cloth diapering" and reading through all of the articles that come up. First, let me say that cloth diapering can be a fashionable choice for your little. If you are into fashion at all, cloth diapering is one way to keep your baby fashionable and trendy. Not that this is important by any means, but cloth diapering can be seriously fun! There are a ton of fun patterns and fabrics available for cloth diapers. Not only are cloth diapers fashionable, but just imagine for a moment that the underwear you have on now is made of paper. I've actually worn paper underwear. Apparently, hospital employees seem to think paper underwear is perfect for just after you've birthed a baby. I wore paper underwear for all of one night before I ditched them without telling anyone and donning my trusty big maternity underwear. I can tell you first hand that paper underwear is seriously uncomfortable. But millions of people seem to think paper underwear is acceptable for their child. I feel really, really bad for those children. And I actually feel bad for Bug because we put her in paper diapers at night. I can't even imagine how uncomfortable that is. Fabric underwear is much more comfortable and soft on your baby's bottom. Your baby might actually experience less rash on their bottom due to cloth diapers. In the beginning, Bug had diaper rash, but by about five months of age, we never used diaper cream on her. Rashes were not a huge issue for us. 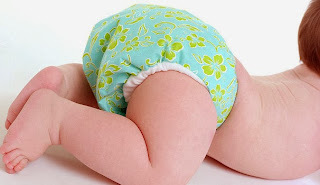 One benefit, that also serves as a negative, to cloth diapers is that children can feel their wet and soiled diapers. While paper diapers keep the moisture and poop from a baby's bottom, a baby can feel the diaper is wet and poopy. This is a benefit for potty training later on, but it's also a negative, at times, for babies. One such time is at night. This is why we put Bug in a paper diaper. She never really woke up at night, particularly after three weeks of age. I felt horrible changing her diaper, which woke her up fully. Paper diapers work well for keeping Bug comfortable at night, all things considered. While cloth diapers do need to be laundered, they are, over time, a huge cost savings over paper diapers. The cost of cloth diapers varies. First, you'll have to pick which style of diaper will fit your needs best. I am so happy with my Bum Genius 4.0 pocket diaper. I love these diapers. They are so easy to use and are made to fit a baby from 8 pounds to 35 pounds. We bought several of these and have enough that we could have two babies in diapers if the need arose. Our costs, initially, were about $500. And that is all we ever need to spend, ever. Most people I've talked to easily spend $40 a month on diapers. A family with one baby in paper diapers will spend more than $500 in 13 months. Let me be the first to say that I've yet to meet a baby in America that was potty trained at age 13 months. Even with the cost to wash and dry diapers, you'll easily save hundreds by using cloth diapers. You'll soon find that babies cost money. They don't have to cost a lot of money, but just birthing your baby, unless you have the best health insurance ever, will cost some serious dough. Saving money on what is essentially underwear for your child is a good way to cut back on some of the bleeding of your money. Cloth diapering takes some work and time, but it's well worth it in the end. You will need to strip the diapers every so often. We've found that every three months works well for us. Each diaper you're going to strip should already be clean. Run the diapers in the washer with soap. Then, keep running the washer until the water runs clear and free of soap. It usually takes us about 4 to 6 rinses. If your baby has produced a poopy diaper, it is helpful to rinse the diaper. We just rinse the diaper in the bathtub. You can buy a fancy diaper sprayer, or you can save some money and just rinse them in the tub. We find the tub works fine. It is just poop, after all. Whether or not you desire to exclusively cloth diaper, you may find that cloth diapering out of your house doesn't work so well. One reason it may not is that cloth diapers take up a lot of space in a diaper bag and paper diapers don't. Either route you choose to go, be sure you have at least two plastic bags in your diaper bag. These will come in handy if you have a dirty cloth diaper you need to bring home. The best way to dry a diaper really is in the sun. This will save you dryer costs (in terms of electricity or actual money if you live in an apartment complex or use a laundry mat) and it helps keep the diapers extra white. Whether or not you cloth diapered with your first, second or third child, if another child is in your future, I pray you consider cloth diapers. I am so glad we chose to cloth diaper and will choose cloth diapering with any other babies I may have in the future.